In this anticipated new edition of Single Case Research Methodology, David L. Gast and Jennifer R. Ledford detail why and how to apply standard principles of single case research methodology to one’s own research or professional project. 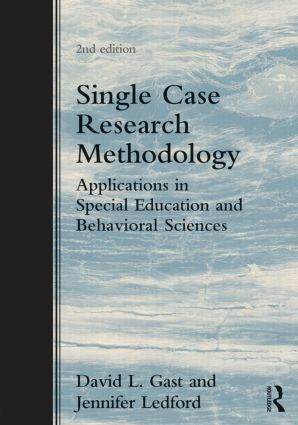 Using numerous and varied examples, they demonstrate how single case research can be used for research in behavioral and school psychology, special education, speech and communication sciences, language and literacy, occupational therapy, and social work. This thoroughly updated new edition features two entirely new chapters on measurement systems and controversial issues in single subject research, in addition to sample data sheets, graphic displays, and detailed guidelines for conducting visual analysis of graphic data. This book will be an important resource to student researchers, practitioners, and university faculty who are interested in answering applied research questions and objectively evaluating educational and clinical practices.